Oh, hey, Fitbit. Nice to see you again. Although we thought the original fitness tracker did too little for a $100 gadget, enough people apparently begged to differ, as the the outfit just trotted out a second-gen model, dubbed the Fitbit Ultra. Like its predecessor, this little guy analyzes eating, exercise and sleep patterns (largely with the help of an accompanying website). If you've been following along, you know that design hasn't changed much, while that website and hundred-buck price should be mighty familiar, too. This time around the company is adding a few new features, including Foursquare-esque badges and an altimeter for counting how many steps you've climbed. But does this series of minor enhancements add up to a significant improvement? Time to lace up your running shoes, kids, and meet us after the break. Fitbit is as easy to use as ever, but the features added to the second generation are too gimmicky to help justify that $100 price tag. How would you rate the Ultra? Though the new Fitbit replaces the one that's been around for two years, its design hasn't changed a lick. It is, to this day, a clip-shaped doo-dad that could easily be mistaken for a Bluetooth headset. It's lightweight enough that it rarely feels invasive. In fact, even when clipped to a thin shirt, you might forget it's there. We're also pretty confident it won't chafe your skin when you clamp it onto the waistband of your running shorts -- a fault we've found with other fitness gadgets. Like the last generation, this thing packs an accelerometer, along with an LED display you can use to glance at steps taken, calories burned and miles traversed. This time, though, it adds an altimeter to track how many "flights" you've climbed. We're using air quotes there because really, this just means changes in elevation. So, if you go on a hilly run, as yours truly did, you might log 36 flights, even if you didn't attempt nearly as many staircases. This generation also adds a clock -- something we can't believe Fitbit omitted the first time around -- along with motivational messages such (e.g.,"Burn it") and the ability to program a customized greeting when you turn the thing on (think: "Hi, Dana"). The screen only accommodates so many characters, though, so the Jonathans and Jennifers of the world are sadly out of luck. Also new: a stopwatch that you can activate by holding down the all-purpose button on the front of the device. Annoyingly, though, once you press the button to freeze the clock, you'll have to do another long-press to see your time. You won't find too many surprises in the box either. Like the last gen, it comes with a small, USB-powered dock that you'll use to charge it and sync it with Fitbit.com. The company says it should last up to seven days on a charge, so we were none too surprised to see that the battery life indicator hadn't budged after we spent five hours out and about. It also re-fuels quickly: in the time it took us to watch an episode of Modern Family, it ticked up from half-full to fully charged. And, like last time, it comes with a plastic holster as well as a soft wristband allowing you to wear the Fitbit while you sleep. To be honest, we're not wild about the thing, since the velcro strap can be irritating. If you have bony wrists (guilty), best to attach it loosely, as the velcro base only extends so far, and the last thing you want is to be left with a tail that'll scratch your skin and get on your last nerve. The only other change we're aware of is that the clip is now available with subtle light blue or plum accents. Then again, if we're talking about a gadget intended to be clipped to a bra or pants pocket, does it really matter? Setting up the Fitbit Ultra is simple and eats up just a few minutes, though once again the company neglected to include any instructions in, or even print them on the box. Still, our intuition told us to go to Fitbit.com, at which point it was obvious we had to download some software (it's Mac- and PC-compatible) and create an account -- a process that requires you to hand over your city, state, country, birthday gender, height and weight. It's at this point that you can program a custom greeting, though you can always return to that later by digging around the device settings menu on the Fitbit site. Throughout our testing, we found ourselves keeping the dock plugged into our computer, and tried our best to get into the habit of charging the thing while sitting at our desk -- a time when we're burning minimal calories anyway. 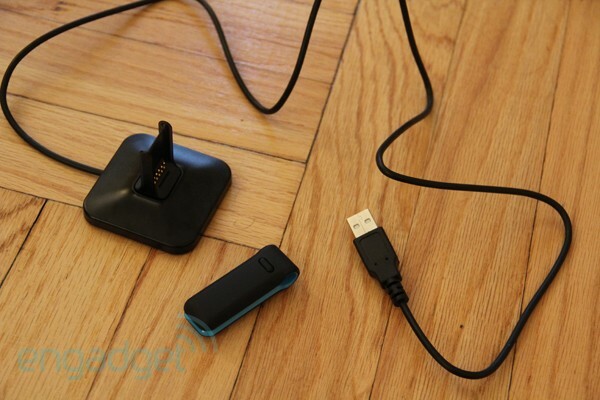 Once you do clip the Fitbit onto its dock, you'll see the battery life indicator flash briefly to let you know it's charging, and pretty soon your latest calorie counts, et cetera will show up on Fitbit's website. You can also sync the device wirelessly, but we preferred the killing-two-birds-with-one-stone effect of syncing and charging at the same time. We'll admit: there's something fundamentally addictive about seeing your numbers rise, but the question isn't so much whether this is fun, but if it's worth a hundred bucks when you could use any number of mobile apps to help you stick to a diet or fitness routine or what-have-you. Fitbit's web interface remains clean, intuitive and free to use, though you'll still have to enter a good deal of information manually in order to get the most out of it. 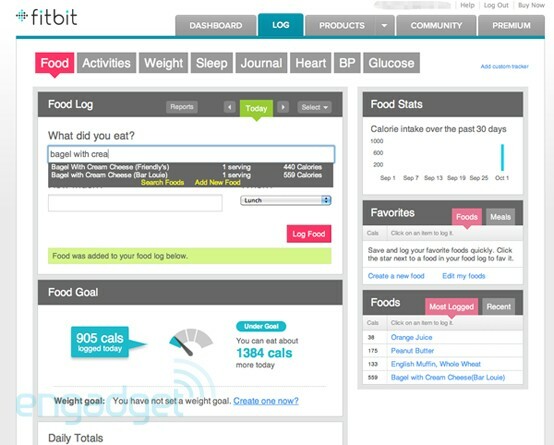 With food, you'll have to go out of your way to keep a food diary, but Fitbit doesn't exactly make it easy. The problem isn't even that you have to stop to log your morning Egg McMuffin. No, the bummer is that Fitbit doesn't have caloric counts for generic foods. Try and enter a bagel and cream cheese, for instance, and you'll have to choose between one sold by Friendly's and another by Bar Louie (one claims 160 more calories than the other). We ran into the same problem when we tried recording the squash and chicken apple sausage a friend served for dinner. Health and fitness magazines regularly give estimates for different kinds of produce, so it's a shame Fitbit doesn't. As it is, having to pretend you ate at Jason's Deli just to settle on a number that may or may not be right would seem to defeat the purpose of calorie-counting. Fitbit also analyzes how well you've been sleeping, but it'll first need to know when, exactly, you got in and out of bed. (You can also do a long-press when you lie down and when you wake up.) Specifically, the website will tell you how many times you woke up during the night and how much time you actually spent sleeping, but even then, that data's closely tied to how often you moved. So, if you were lying awake with your mind racing, Fitbit may have thought you were sound asleep after all. Fitbit will automatically track your steps, mileage, flights climbed and calories burned. But here's the rub: it's often wrong. One day, our mileage count was five miles higher than what we calculated using the service MapMyRun (22-some-odd miles versus 17). That's not to say MapMyRun is pitch-perfect either, but either Fitbit's off or the truth lay somewhere in between. And we have reason to believe it was Fitbit that made a mistake: because it uses an accelerometer to calculate steps, it'll interpret any movement as a step -- even your restless leg syndrome. On the flip side, Fitbit doesn't take into account the exercise you might be getting through other sports, such as cycling or skiing (forget swimming -- this thing's not waterproof), so you'll have to manually enter those, too, and keep a careful record of how long you were working out. Still with us? 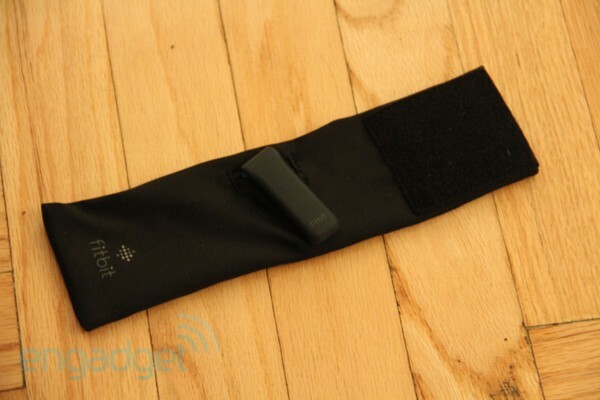 Well, so far we've basically been describing Fitbit as you've known it for the past two years. The interface hasn't changed, with the exception of that dashboard you see down there. For the most part, though, the changes here are minor. You can now earn badges -- yes, the likes of which you'd expect to collect on Foursquare. You might nab one if you walk 5,000 steps in a day or climb the equivalent of ten flights of steps. Just one question, though: who are you competing with? The beauty of Foursquare is that you don't have to know anyone using the service to enjoy the thrill of ousting somebody as mayor. With Fitbit, there is a community, complete with forums, but you'd have to feel strongly enough about the product to get involved. You could also mine your Facebook account for fellow Fitbit users, but they don't appear to be a common breed. As it is, out of 646 Facebook friends, yours truly found only one with a Fitbit, and sharing step counts with an acquaintance like him would have been tantamount to oversharing. That leaves us collecting badges for the sake of decorating our homepage, which may or may not be interesting to you, depending on how motivated you already are. Of all the changes on the software side, the addition of food goals would seem to be the meatiest (pun not intended). After entering your target weight, the number of suggested calories per day varies depending on just how active you've been. We're not sure this really helps justify the $100 cost of the hardware, but it's nice to know that not all of the tweaks here are gimmicks. And as minor as any of this sounds, it at least constitutes a free upgrade for all current Fitbit owners. That's right, while you can't retrofit your device with an altimeter, you can take advantage of all the new online features, gimmicks and useful stuff alike. It's also worth noting that Fitbit devotees soon won't have to be glued to open a browser (mobile or otherwise) to check up on their stats -- the company is launching an iOS app this week, with an Android version coming soon. With the app, folks will be able to log their food intake and various activities, even if they're offline. As it happens, neither app was available while we were testing this, so we're just going to have to stop short at saying that adding mobile apps seems like a no-brainer for a service like this. If we were reviewing the Fitbit Ultra in a vacuum, we'd say this: it does what it claims to do quite well. Here you have a lightweight, long-lasting piece of hardware with some easy to use software to match that does, indeed, make weight loss and all that it entails (namely, calorie counting and exercise) just a bit more fun. Particularly for people who have already committed to weight loss programs that rely on or at least encourage pedometers (think Weight Watchers), Fitbit can be a convenient alternative to entering all that data manually -- even if it doesn't pick up on everything by itself. 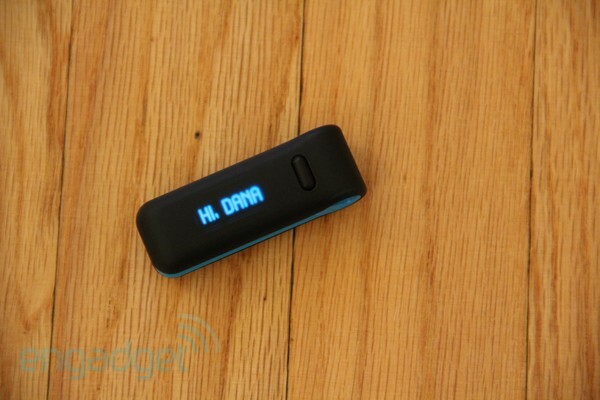 And yet, it remains difficult to see Fitbit as much more than a pricey, gussied-up pedometer. If the hardware weren't $100, but instead closer to $50 (or less, even), we might be more forgiving. As it is, though, it's tough to recommend this to someone interested in making a few lifestyle changes when there are other, less costly tools out there -- not just pedometers, but a slew of apps that run the gamut from food diaries to step counters. And while the latest version adds some new features, none are enough to justify the price -- not even those gimmicky motivational messages. On top of all that, something tells us the forthcoming Jawbone Up might well give this a run for its money, as it, too, will analyze food intake, sleep habits and exercise. Until then, is this fun, admittedly addictive device worth all that money for people who want to lose weight? That all depends how many badges you need to stay on task. San Francisco, CA – October 3, 2011 – Fitbit, the market leader in wireless activity tracking, today launched its newest tracker, the Fitbit Ultra. The Ultra contains all the core functionality of the original tracker: tracking steps, distance, sleep, wireless uploads to Fitbit.com, and free online tools, with a device display for real-time feedback. By combining new features with additional social and motivational online tools, plus Fitbit's first iPhone app, the Ultra aims to provide a more powerful and fun way for you to get more fit and active throughout your busy day. - Greeting – Name your Fitbit Ultra and it will appear on your display – "Jane" or "FitBuddy"
- Badges for climbing stairs, steps, and distance keep you motivated. - New ways to share fitness achievements on Facebook or Twitter to tap into your support network. - Easier ways to find friends to compete with or share out your fitness progress achievements. - Food Goal, a weight management tool that dynamically changes based on activities you complete during the day. 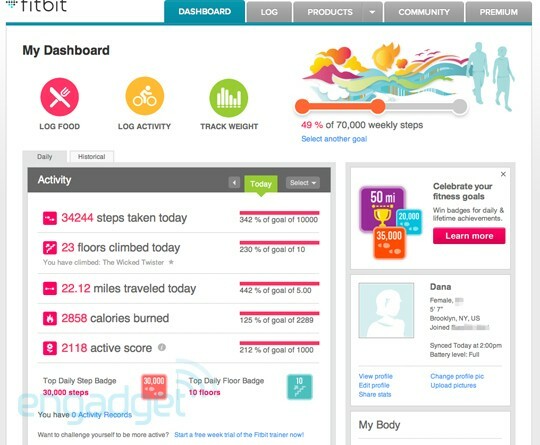 - Fitbit's first iPhone App for tracking food and activities on the go. "At Fitbit, we are dedicated to creating everyday health and fitness products that are easy for you to incorporate into your life. From our own research we have learned that for these products to be successful they must provide real-time stats to help people make smart decisions during the day, be comfortable and discreet to wear, upload wirelessly and be affordable," said James Park, CEO of Fitbit. "For Ultra, we held true to this." The new Fitbit Ultra Wireless Activity Tracker is currently available in the U.S. and Canada by ordering online at www.fitbit.com for $99.95 and will be available by mid-October in select retail locations across the U.S. Trend research indicates our shift to a more sedentary lifestyle is slowly taking its toll on our health. Health experts advise that we can minimize the negative impacts of low physical activity in our lives in simple ways: by walking and being generally more active throughout our day. Also, recent studies show that adding stair climbing into a daily routine is proven to lower body fat, minimize waist circumference and burn up to 400% more calories than walking. "By combining stair climbing with social and motivational features, we think we can help people fit more fitness into their every day lives in a fun and easy way," said Park. 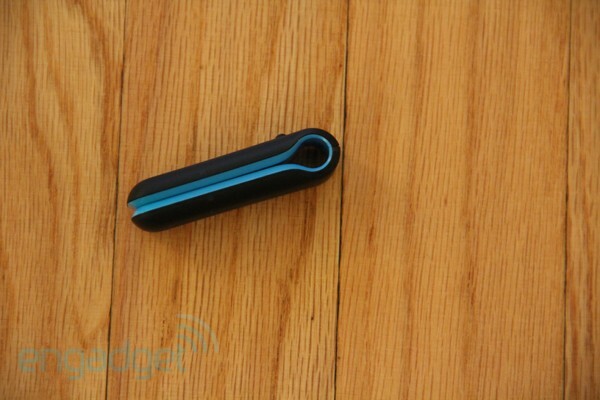 The new Fitbit Ultra is the only all-day activity tracker to measure floors climbed. Ultra's accelerometer and state-of-the-art altimeter technology work together to track movement from climbing the stairs. This smart technology combination understands the difference between climbing stairs and taking the elevator. Fitbit also updated its online dashboard to better track personal fitness metrics and achievements for a more visually motivating, comprehensive experience. For example, Fitbit.com compares daily climb activities to well-known landmarks around the world such as The Eiffel Tower and Machu Picchu.